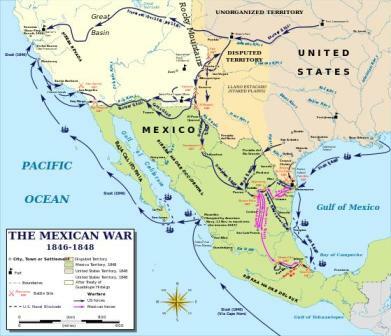 The Mexican-American War was fought between the United States and Mexico from 1846 to 1848. It was primarily over the territory of Texas. Texas had been a state of the country of Mexico since 1821 when Mexico gained its independence from Spain. The Texans, however, began to disagree with the government of Mexico. In 1836, they declared their independence from Mexico and formed the Republic of Texas. They fought several battles including The Alamo. In the end, they gained their independence and Sam Houston became the first President of Texas. In 1845, Texas joined the United States as the 28th state. Mexico didn't like that the United States took over Texas. There also was a disagreement over the border of Texas. Mexico said the border was at the Nueces River while Texas claimed the border was further south at the Rio Grande River. President James K. Polk sent troops to Texas to protect the border. Soon Mexican and US troops were shooting at each other. On July 7, 1846 the United States declared war on Mexico. The Mexican army was led by General Santa Anna. The US forces were led by General Zachary Taylor and General Winfield Scott. General Taylor's forces were the first to engage the Mexican army. They fought an early battle at Palo Alto where the Mexicans were forced to retreat. General Taylor advanced into Mexico fighting battles at the city of Monterrey and a mountain pass called Buena Vista. At the Battle of Buena Vista, Taylor and 5,000 troops were attacked by 14,000 Mexican troops led by Santa Anna. They held off the attack and won the battle despite being outnumbered. President Polk didn't trust Zachary Taylor. He also considered him a rival. Instead of reinforcing Taylor's troops to capture Mexico City, he sent in another army led by General Winfield Scott. 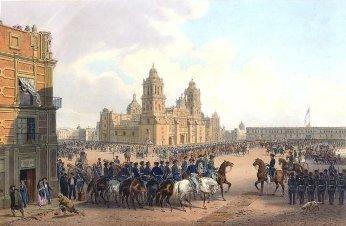 Scott advanced on Mexico City and captured it in August of 1847. With the United States in control of their capital city and much of the country divided, the Mexicans agreed to a peace treaty called the Treaty of Guadalupe Hidalgo. In the treaty, Mexico agreed to the border of Texas at the Rio Grande. They also agreed to sell a large area of land to the United States for $15 million. Today this land makes up the states of California, Nevada, Utah, and Arizona. Portions of Wyoming, Oklahoma, New Mexico, and Colorado were also included. Several of the commanders of the US troops would become leaders during the American Civil War including Robert E. Lee and Ulysses S. Grant. Mexico gave up around 55% of its territory to the US after the war. 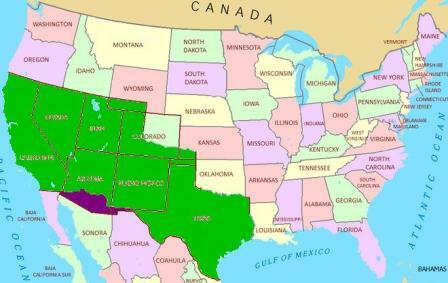 The territory was called the Mexican Cession in the United States. When the US attacked the Mexican Military Academy at Chapultepec Castle in Mexico City, six Mexican students fought to the death defending the castle. They are still remembered as the Ninos Heros (meaning "boy heroes") in Mexico with a national holiday on September 13. There was also a rebellion in California during the war where settlers declared their independence from Mexico.